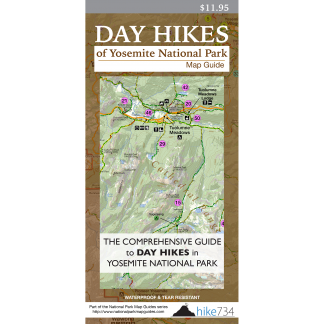 Hike an old road along the cascading South Fork Merced River to a swinging bridge. Pass through the gate where you’ll wander through a nice, airy forest along the river. 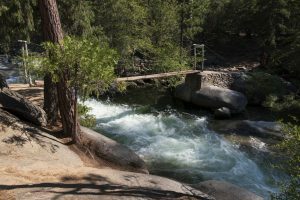 As you get closer to the bridge, a small trail leads to granite slabs at the river’s edge. Continue a bit further to the plank and cable bridge. The alternate route from the Chilnualna Falls Road passes through a similar forest for a total distance of 0.6mi/1km. Trailhead: Turn off Wawona Road onto Forest Drive and follow that road to the Seventh Day Adventist Camp. Take a left onto the dirt road to the parking area. The hike begins on the other side of the gate. The alternate trailhead is at the end of the Chilnualna Falls Road.